Do you have a question you've been wanting to ask Bruce all preseason long? Well, here's your chance. 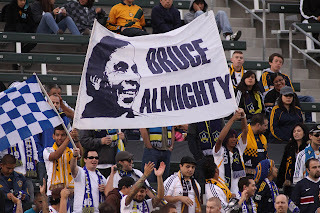 Bruce will talk part in an online chat with ESPNLosAngeles.com this Friday at 12:30 p.m. Ask him about Buddle, the Brazilians or the game against the Revs, for example, or you can simply sit comfortably in front of your computer and read the chat unfold. However, we suggest you do the former. It's more fun that way. If you can't make it to the chat, you can click on the link above and submit your questions now. "Why haven't you upgraded players like Kirovski, Gordon, Eddie Lewis, Jordan?" Do you really feel that these players are MLS quality?"